Tinkoff Bank, also known as Tinkoff Credit Systems, was revealed as the new co-sponsor of Team Saxo Bank at a press conference in Hellerup, Denmark, in a deal that will last through 2013. Oleg Tinkoff, former head of the eponymous Professional Continental team, is a self-confessed cycling fan, but found himself pushed out of the picture at the end of 2008 as much of his team was assimilated by the then new Katusha ProTeam. 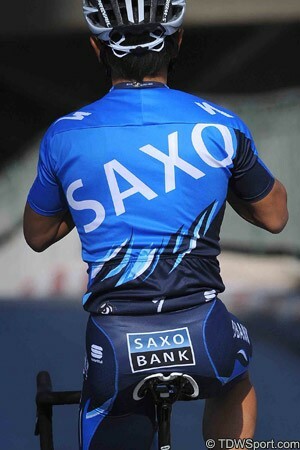 Saxo Bank, which has sponsored the team since 2008, has also agreed to continue for a further year, meaning that the team will be called “Team Saxo Bank-Tinkoff Bank” until the end of next year. "This is indeed a great day and a proud moment for our cycling team, and I believe we now have a very strong setup for the future development of Riis Cycling and our team," said team owner Bjarne Riis. "To continue with Saxo Bank as a main sponsor shows in words and action that together we have been able to build an extremely strong partnership based on the obvious benefits for both of us over the past five years. “Today, to also be able to announce and warmly welcome Tinkoff Bank on board makes me even more proud,” he added. “I'm honoured to partner with two such highly professional and dedicated companies, who share a great passion for cycling, but also see commercial benefits in sponsoring our team." The Tinkoff Credit Systems team was founded in 2006 - as Tinkoff Restaurants - and although it lasted just three seasons, it gave a European introduction to a number of Russian riders, including Mikhail Ignatiev and Pavel Brutt, who now form the backbone of the Katusha team. Tinkoff himself was one of the team’s registered riders back in 2006, and is clearly pleased to be back at the top of the sport, as a sponsor at least. “We are proud to return to cycling and to be sponsoring this team and Bjarne Riis who is without a doubt the best manager in the cycling world,” he said. “And we are delighted to be joining our co-sponsor Saxo Bank, one of the most highly regarded businesses in the world of online banking, and an excellent strategic fit for us - as a cutting edge, online bank ourselves that is leading the field in Russia. The team’s new jersey - which is a blend of the blue colours of Saxo Bank, and the yellow of Tinkoff - was also unveiled, and will see its first action in the Tour de France, which start on Saturday, June 30th. Video: Live broadcast of Team Saxo Tinkoff’s London press conference; will Tinkov take over ownership from Riis?